This product is no longer available and has been replaced by: CPEC310. 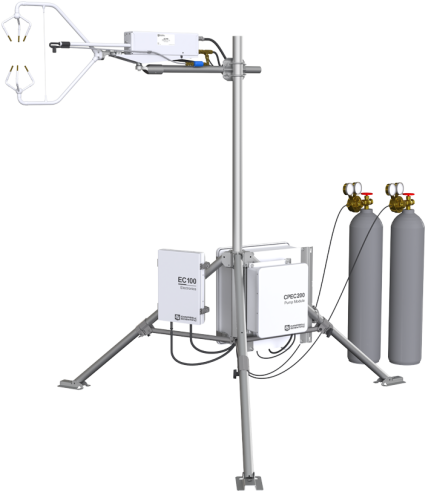 The CPEC200 is a turn-key, closed-path eddy-covariance (EC) flux system for long-term monitoring of atmosphere-biosphere exchanges of carbon dioxide, water vapor, heat, and momentum. A complete system consists of a closed-path gas analyzer (EC155 closed-path gas analyzer), sonic anemometer (CSAT3A sonic anemometer), data logger (CR3000 datalogger), and sample pump. A valve module is also available for automated zero and span. A 16 in. by 18 in. fiberglass enclosure houses the data logger, optional data storage peripheral, optional valve module, and the electronics that interface with the CPEC200 pump module. The CPEC200 system enclosure can be mounted to a tripod mast, CM106 tripod leg base, tower legs, or a large diameter pole. The pump module, a standard component of the CPEC200 system, consists of a small dual-head diaphragm pump with a brushless DC motor mounted inside a fiberglass enclosure. An integral cable connects the pump module to the CPEC200 system enclosure, which provides power, temperature measurement and control, pressure measurement, and pumping speed measurement and control. Campbell Scientific offers two valve module versions. The basic three-valve module (pn 27559) enables the CPEC200 system to automatically perform zero, CO2 span, and H2O span measurements. The six-valve module (pn 26578) includes three additional valves to allow more CO2 span tanks to be measured. The valve module is housed inside the CPEC200 system enclosure. The outlet of the manifold has a proportional valve to automatically control the flow of zero/span gas. A scrub module (pn 27423) is available for the CPEC200 which provides a zero air reference source for the CPEC200 without the need for an extra cylinder which can be useful in remote applications. The CPEC200 scrub modules pulls ambient air through three bottles of molecular sieve, effectively scrubbing CO2 and water vapor from ambient air to produce the reference zero. The scrub module and its small diaphragm pump are housed within a weather-tight fiberglass enclosure which is compatible with a variety of mounting options. Note: Contact the Campbell Scientific Micromet group for questions or updates regarding the data logger program. Is the heater for the CPEC200 positioned along the intake pipe? The heater for the CPEC200 is not positioned along the intake pipe. The heater is in the "snout/rain-cap" of the vortex intake. How is the intake pipe of the CPEC200 heated? There is no heater along the intake pipe of the CPEC200. An air gap insulates the intake pipe (1/8 in. OD) from the outer shell (1/2 in.ID), so the air traveling down the intake tube retains most of the heat absorbed at the intake. With the new vortex intake, has the power drain changed for the pump module fan for the CPEC200? The pump module fan continues to draw 0.7 W while operational. For the CPEC200, is the heater on the vortex intake controlled the same way as it was prior to the addition of the vortex intake? Yes, the heater is controlled the same way. Campbell Scientific recommends leaving the heater on all the time. Has the vortex intake changed the way the pump for the CPEC200 works? Yes, the pump works a little harder with the new vortex. The recommended flow for the new vortex system is 8 LPM (6 to sample cell + 2 to bypass). 7 LPM was recommended for the original system. Also, the sample cell “differential” pressure is slightly lower (~-6kPa_new versus ~-3kPa_original). It’s a balance of parameters to maintain good frequency response, low power, and low maintenance. When is it time to clean the sample cell windows and exchange the blue filter, which is a part of the vortex system of the CPEC200? Sample cell windows should be cleaned when the optical signal strength (CO2 and/or H2O) diminishes to 80%. A conservative approach is to change the blue filter (Campbell Scientific pn 31210, Parker pn 9922-05-DQ) at the same time that the windows are cleaned. The inside of the vortex body may require cleaning with a lint-free wipe and clean water or isopropyl alcohol at the time of the filter change. An increased magnitude of cell-pressure drop may also indicate a clogged filter. The table below shows some example cell pressure readings in our laboratory with the CLIP-ON vortex. Readings with the “100% clogged” filters were made by physically plugging the bypass tubing. Note: These pressures do not apply to the new standard vortex intake, which has more pressure drop and requires a different filter kit (Campbell Scientific pn 32203) that consists of a filter with pre-installed Swagelok nuts. When the pump for the AP200 or CPEC200 wears out, can it be repaired, or does it need to be replaced? If the pump fails, it must be replaced. Contact Campbell Scientific for details. For the process of returning equipment to Campbell Scientific, refer to the Repair and Calibration page. Why are some tubes difficult to connect, requiring a wrench to completely tighten the nut? Can something be done about this? The threads on the nut and fitting have likely been damaged because they were over tightened. Replace both the nut and the fitting. How long will the sample pump for the AP200 or CPEC200 last? The pump has a one-year warranty. Although the pump’s manufacturer does not specify an expected lifetime, the pump’s lifetime is expected to be significantly longer than one year.